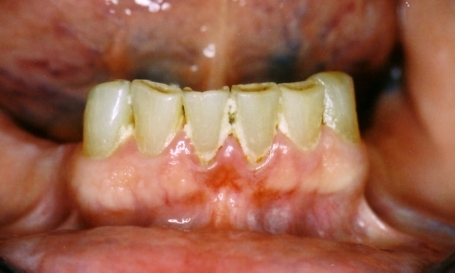 This 70-year-old woman presented with an ill-fitting upper full denture and a lower removable partial. Examination also revealed worn down lower front teeth and a reverse smile line. 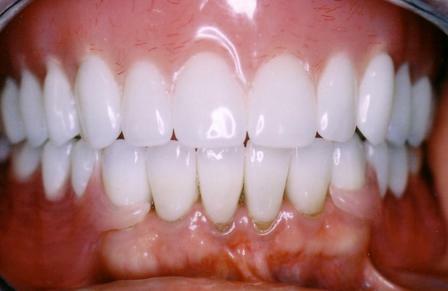 To properly restore her teeth, porcelain veneers are first constructed. 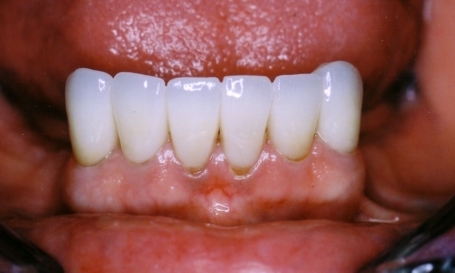 Post-op photo: each front tooth has an increase in length of 1.5-2.0 mm. Observe the overall improved esthetics and alignment. Phase II treatment includes the construction of an upper full denture and a lower metal-free removable partial. Post-op photo: the metal-free partial blends in well with the six porcelain veneers. Upper full denture is constructed to re-establish patient’s proper vertical dimension.